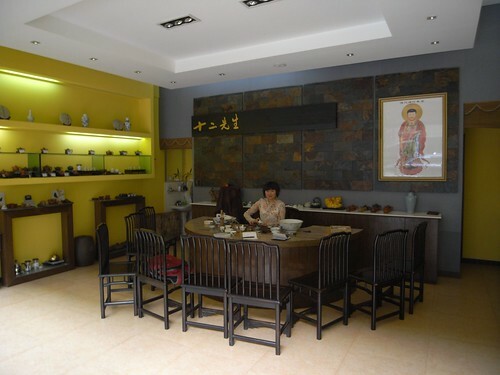 I’ve been spending a lot of time recently hanging out at the tea shop owned by the 12 Gentlemen, a group of puerh aficionados here in Kunming. 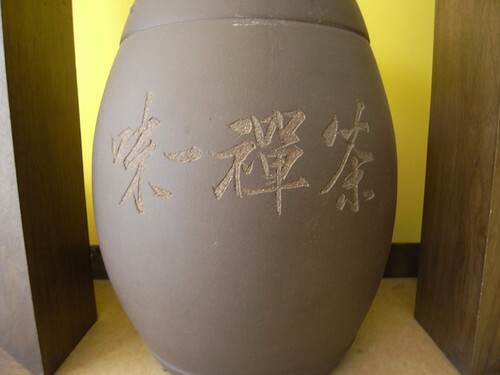 The name itself is a reference to the 12 accoutrements deemed necessary for preparing tea in the Song dynasty. Of all the producers I’ve come across, these guys seem to be the most interesting. As true puer geeks, they source leaves directly from the mountains, overseeing every stage of the production, tweaking variables on a small scale to fine tune their productions. I’ve learnt a lot in this place. Despite my limited Chinese, and their limited English, somehow we’ve always either had someone handy to translate, or patiently muddled through with the help of dictionaries, charades, nods and smiles. One of the managers, who seems to be in the shop most days, has been teaching me bits and pieces about the grading and selection of leaves, methods of tasting, testing and assessing a tea. Each time I go, he brews a new tea for me to try. Without telling me anything of the history or quality of the tea, he’ll brew it and ask my opinions. Sometimes I chance upon an answer which is close to the mark, sometimes I’m way off, but it’s fun to play and, when a tea is bad, it’s usually pretty obvious. The game gets harder when he brews teas that have been artificially doctored by some unknown process to make them seem more aged. Sometimes this has been done so well that it’s really very hard to tell – sometimes it’s just a slightly burnt smell from the dry leaves, an unusually red liquor, a strange taste or feeling at the back of the throat that give it away. It’s useful practice for identifying the fake teas that are on the market. 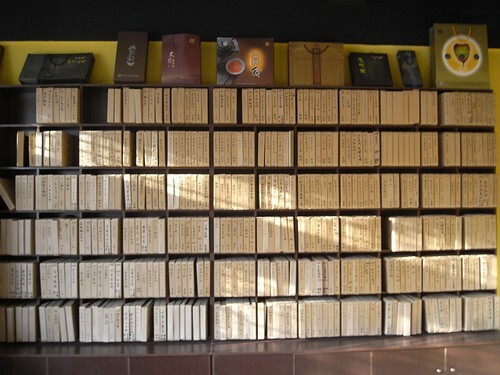 Hidden upstairs from their shop is the most extensive puerh library I’ve come across. The amalgamation of several large individual collections, the aim here is to catalogue puerh from subsequent years, from many areas, from a variety of producers. That way, they have a reliable reference for how a good tea from any particular mountain from any particular year should taste. 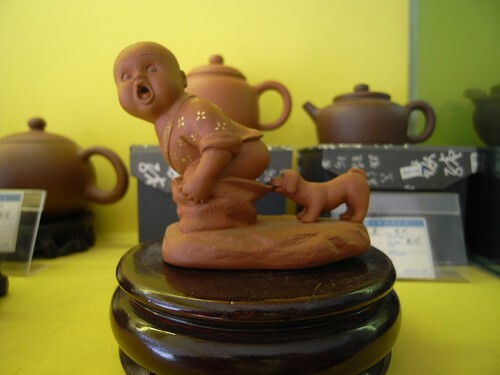 Several times I’ve wandered into their shop at the end of an afternoon wandering the tea market and produced a bing I’ve just bought. After a cursory examination, they’ve produced a bing from the same year and same area to brew side-by-side. Sometimes the tastes are very similar, sometimes remarkably different. Sometimes my newly-purchased bing compares favourably to their collection item, sometimes poorly, but it’s always interesting to be able to compare personally and get an unbiased opinion from someone with much much more experience than I.
I apologise for the lack of photos of this event, my camera just got stolen, but wandering randomly into the tea shop a couple of days ago I encountered one of the Gentlemen I hadn’t come across before. He owns the majority of the puerh library, and this day had come to the shop with a baggie filled with 100 year old pu. I’d arrived quite late in the brewing and the atmosphere was very relaxed, when tasting my first cup I understood why – the qi of this tea was very powerful. Immediately my whole body relaxed and all was well. My only previous experience with a chaqi of this strength was whilst drinking 1958 GuanYunGong with Hobbes & Lei, and since drinking so much young tea recently I’d forgotten how good an old tea can really be. I make a mental note that I really should to try to drink old pu slightly more often. Copyright © 2018, The Essence of Tea Ltd. All Rights Reserved.